Ald'ruhn is the district seat of House Redoran, and one of the largest settlements on Vvardenfell. The three principal districts are Ald'ruhn town, Ald'ruhn-under-Skar, and Buckmoth Fort. Ald'ruhn town is a large settlement in the Redoran village style, built of local materials, with organic curves and undecorated exteriors inspired by the landscape and by the shells of giant native insects. Most guildhalls, cornerclubs, and merchants are sited in the southwest corner of town, convenient to West Gate and the strider port, while the Temple is located on high ground to the east, and surrounded by a residential section. Ald'ruhn-under-Skar is the most distinctive architectural feature of Ald'ruhn -- a manor and council district sheltered beneath the shell of an ancient extinct giant crab. The large carapace encloses a central dome, from which radiate the entrances to the Redoran Council chambers, the manors of the Redoran councilors, and shops of a few upscale merchants. Buckmoth Fort is the Imperial legion garrison for the district. The strong walls and towers of this Western fortress lies a short distance to the south of Ald'ruhn town, through South Gate behind the Mages Guild. House Redoran services are in the Council House and Councilor's Manors of Ald'ruhn-Under-Skar. The Ald'ruhn Temple on the east side of town provides service for Temple worshipers. Buckmoth Fort offers services to the Imperial Legion and devotees of the Imperial cult, including an Imperial cult altar. The guildhalls of the Fighters Guild and Mages Guild are near the South Gate. Pricy but high-quality clothier, alchemist, and enchanter shops are under Skar as well. Commodities at reasonable prices, but with smaller selections, are available from the smith, clothier, trader, pawnbroker, and bookseller near the entrance to Ald'ruhn-Under-Skar. The Ald Skar Inn and the Council Club cornerclub are found to the west, near West Gate and the silt strider port. The Rat in the Pot cornerclub is in south Ald'ruhn, near the guildhalls. All six Redoran councilors, Brara Morvayn, Hlaren Ramoran, Athyn Sarethi, Garisa Llethri, Miner Arobar, and Bolvyn Venim, have manor residences in Ald'ruhn-Under-Skar. Edwinna Elbert is the Mages Guild steward, and Percius Mercius has recently become the Fighters Guild steward. Old Methal Seran is an eminent Temple priest and scholar. Raesa Pullia is commandant of Buckmoth Fort, but Imsin the Dreamer is the chapter steward. The Redguard Hean is priest of the Imperial cult. Goren Andarys is the guild steward of the Morag Tong, whose guildhall is found in Ald'ruhn-Under-Skar. Roads lead northwest to Maar Gan and Gnisis villages and by a circuitous western route to Caldera, Balmora, and points south. The road to Balmora swings northwest to avoid the barren wastes, and curves around towards the west until it heads south again to Caldera. Between Ald'ruhn and Caldera are many sidepaths; watch for signposts, or you'll get lost. The silt strider port is along the western town wall, north of West Gate. Silt strider service goes from Ald'ruhn to Balmora, Gnisis, Khuul, or Maar Gan.. Guild guides at the Mages Guild teleport you to Balmora, Vivec, Caldera, and Sadrith Mora for a modest fee. 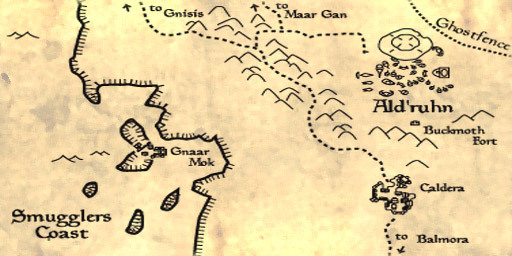 Gnaar Mok is a LONG and exceptionally unpleasant walk west to the coast and then south; there are no trails or marked routes. Casual travelers ill-equipped for the attacks of wild beasts and brigands should keep to the roads and travel services. This page was last modified on 18 October 2018, at 02:41.